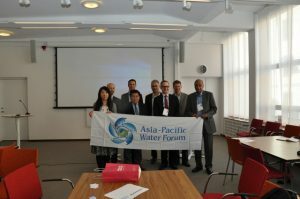 During the Stockholm World Water Week 2018 -2020, the Asia-Pacific Water Forum (APWF) served as an overall coordinator of the Asia Focus Sessions, having been exchanged the Memorandum of Understanding with Stockholm International Institute (SIWI). 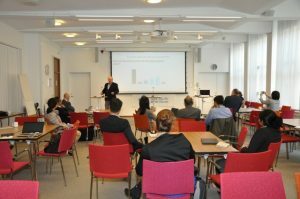 In the Stockholm World Water Week 2018, under the overarching theme of the Week “Water, Ecosystem and Human Development”, the APWF co-convened the following 4 sessions with its partner organizations as part of realizing the “Yangon Declaration: Pathway Forward” adopted in the 3rd Asia-Pacific Water Summit (3rd APWS) in December 2017. Through the sessions, we engaged with global stakeholders sharing knowledge, best practices, and lessons learned to address water security for sustainable development in Asia and the Pacific. (4) Asia Focus: Challenging Nexus technologies, a force for good? The details of the 4 sessions are described below. 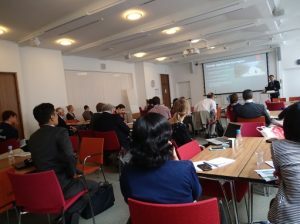 This session demonstrated the importance of sensitive approaches to the preservation and careful use of natural water storage options for the common good, rather than the reliance on large-scale built infrastructure, such as dam. Groundwater conservation through the projects of converted paddy fields and maintaining the watershed protection forests with the introduction of payment of eco-system services (Kumamoto City, Japan). All cases demonstrated that successful implementation depend not just on technical know-hows but also on establishing the right institutional arrangements, stakeholders building trust within local communities while also promoting capacity building. Natural alternatives, integrated within water resource systems, can contribute to the multiple goals, including water-food-energy security, biodiversity conservation and resilience from disasters and climate change. 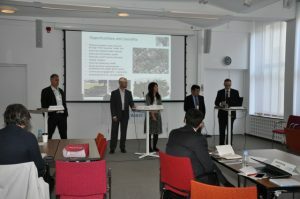 This session highlighted that the closer attention needs to be paid to future water storage throughout Asia. Planning will need to be more integrated across scales with much greater consideration of possible alternative storage options and the potential complementarities between them. It was also suggested about the necessity of conducting the research to better understand different storage options not just under different biophysical conditions but also socio-economic circumstances. 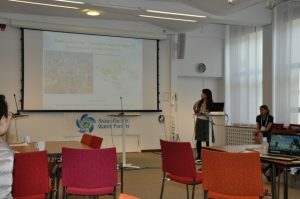 This session discussed how each city in Asia has managed to include water as a key factor of sustainable, resilient and green urban development. It also discussed how they had managed to promote the policies and measures to make livable, resilient, sustainable, and productive cities restoring water related ecosystem. The case studies demonstrated the approaches and pathways, including how each city promoted the policies and measures by gaining cooperation from multi-stakeholders of community, and how they aimed to overcome their challenges. In the Panel discussion, an online survey system, Mentimeter, was used to conduct interactive discussion with audience. In Asia, where rapidly developing today, the need for the development of a green city through sensible water resource management has been gradually recognized, however, almost all audience considered the level of the integration between urban and environment is low. When asked about the priority action for developing green cities by making 5 multiple choices, such as finance, infrastructure, governance, behavior change and stakeholders’ participation, the majority answered governance was the priority action in Asia. The design and pathways to realize water sensitive and green cities are different depending on a city as it is also different from the view of geopolitical and political economy. The speakers and audience of this session highlighted the necessity to develop enabling environment where all stakeholders join the decision-making process of the city development to examine the pathways toward the healthy, livable, resilient, sustainable, and productive and green cities. 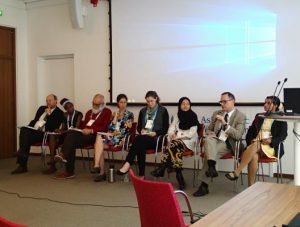 This session looked at regional experiences with a variety of financing mechanisms to protect ecosystems and promote nature sensitive solutions to water and environmental challenges in countries with differing policy environments and levels of development. In Asia, the financial mechanisms to promote climate change measures have been increasing and diversifying. These include 99 multilateral and bilateral climate funds in operation, 50 international public funds, 60 carbon markets, and 6,000 private equity funds. In addition, the measures to promote green financing have also increased. For instance, Singapore announced it would lead the ASEAN Green Finance Hub. The Chinese Government participated in the Green Bond Market and became the top issuing country of Green Bonds. In order to mobilize private sector’s financing for sustainable bankable projects in the water sector, WWF has promoted water stewardship and aims to transform the investment landscape, redirecting substantial financial flows into sustainable water projects for river basins. The Alliance for Global Water Adaptation announced the Climate Bonds Standard Water Criteria Phase 2 in partnership with the Climate Bond Initiative, Care, CDP, and World Resources Institute (WRI). It provides credible evidence-based criteria for long-term investment in ecosystems and hybrid infrastructure, such as wetlands and watersheds including for purposes of water collection, storage, treatment and distribution, flood protection and drought resilience. On the other hand, the existence of various barriers was mentioned. For instance, in the case of climate finance, GWP made the point that developing countries have argued projects are not strongly nation-driven and are often biased towards donor needs and interests, because the projects have been hampered by their institution-building capabilities. OECD pointed out that barriers to invest in nature-based solutions are numerous, i.e., benefits are not easily monetized, lack of data of track records, and lack of policy coherence. WWF made the point that it is necessary to strategically use public, development banks and philanthropic sources to mobilize private finance, as there are limited viable bankable projects. It is also necessary to strengthen regulations and coordinate them at the basin level. Feasibility studies should also be strengthened through collaboration among public, private sectors and NGOs in order to reduce investment risks in the water sector. Speakers highlighted the fact that applying new or innovative financing options for ecosystem management requires careful design in order to target the specific environmental issue/s of concern and should be well supported by institutional and policy frameworks at the appropriate levels of jurisdiction. They also emphasized the necessity of strong regulatory frameworks and governance structures, and the need for transparency in the use of proceeds. 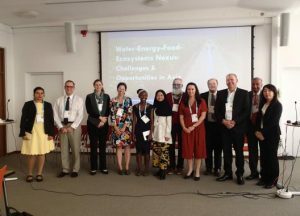 The objective of this session was to highlight the complex and interconnected nature of water, energy, ecosystems and food, with a specific focus on the role that new technologies play in solving and/or exacerbating nexus issues – particularly as resources become scarce. This session organized the debate with the question, “Is technology a force for good, or a force to be calculated with caution under the growing competition for limited resources within the water-energy-ecosystems-food nexus”. The session ensured gender balanced teams of speakers, including the participation of two young professionals. Debaters pointed out the positive and negative impacts of technologies. While some technologies can bring benefits and new opportunities for people and communities, others result in increased water scarcity by demanding an increasing amount of water, resulting in a conflict of interest among key stakeholders in the water cycle. 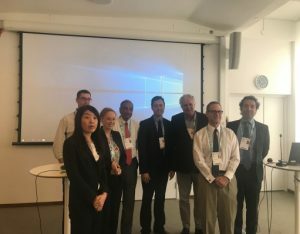 The main debate addressed the balance between stakeholders for water demands, leading to questions regarding the regulatory and policy environment to appropriately address the negative impacts or trade offs as a result of the interconnected nature of the nexus, rather than the technologies themselves. It is necessary to focus on the processes and procedures to address nexus issues by the adoption of the appropriate technologies, policies and institutions based on an analysis of the social, economic and physical environment to achieve fit-for-purpose solutions on a case by case basis. Overall, this session implied that win-win solutions are very limited. It is thus important to examine ways to minimize negative externalities by adopting and adapting technologies using information and participative approaches and consulting key stakeholders in order to appropriately address nexus issues. The main suggestion was to ensure the use of data which is based on spatial and temporal dimensions, as it is necessary to assist in informed decision-making. A longer term approach would involve using these methods in professional education and training.